Thanks to an AmericaView mini-grant and the labor of some intrepid students we were able to do a detailed damage assessment of some of the areas in Vermont hardest hit by Hurricane Irene back in 2011. The pre-event imagery was sourced from the National Agricultural Imagery Program and we obtained post-event WorldView-2 imagery from the USGS Hazard Data Distribution System (HDDS). Below are some key take-away points for this type of work. It's all about the resolution. As much as I love Landsat you really need high-resolution imagery, such as WorldView2, to see the type of damage causes by an Irene-type event. Manual image interpretation. While we would like to think that all we need is imagery from two different dates and a press of the Staples Easy Button to get results, the reality is much more complex. This is particularly true in post-event disaster response. Automated detection may help highlight areas of change, but chances are you will have to do it the old way to precisely quantify the damage. No one beats a human when it comes to high-resolution image analysis. Georegistration is a challenge. 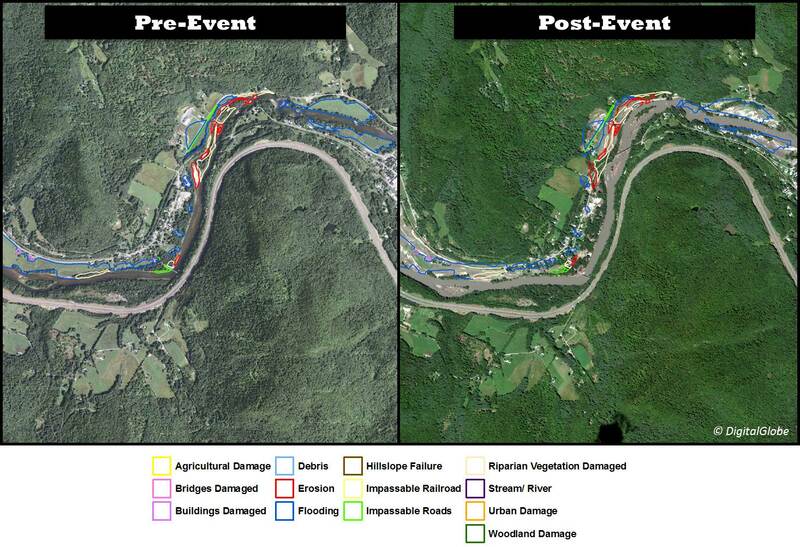 Much of the imagery that was acquired post-Irene was done so at rather extreme look angles. Orthorectificaton did not yield promising results and it was time consuming. Thus, all the damage mapping was done on the more accurate pre-event imagery through good old fashioned terrain association. The offset is shown quite clearly in the above graphic. Come up with a damage class domain. Lots of interpreters may be working on the same project and thus it really helps if you can come up with a list of damage types so that all of the datasets are consistent. Work locally. The cloud and networks tend not to fare too well during disasters. Digitizing goes a heck of a lot faster when the imagery is stored locally.